United Nations chief Ban Ki-moon, left, arrives for a meeting with the Polisario Front's representative at the U.N. in Bir-Lahlou, in the disputed territory of Western Sahara, March 5. October 7, 2016 — Links International Journal of Socialist Renewal reposted from International Viewpoint — On April 1st each year the United Nations Security Council devotes a meeting to a debate about the issue of Western Sahara and the tasks of the “MINURSO” mission. The meeting starts with a report by the UN secretary-general followed by interventions by the permanent members and the non-permanent members. It ends with issuing of the decision that sets out the plan for the next year as regards negotiations between the two parties to the conflict and numbers and funding of the mission. Since the cease fire in 1991 and as a result of the stalled preparations for the referendum in Western Sahara, efforts have been focused on finding an alternative formula adapting the “methodology of political negotiation” to reach an “agreed solution acceptable to both parties”. Since that time, the two parties have focused their tactics and their instruments of pressure with the date of the April hearing and its decisions in mind. The balance of power in the Western Sahara is currently in favour of the Moroccan regime both in terms of the internal situation in the region and in terms of the level of international support. A bourgeois class has been created in the region which dominates significant activities in the region, within and outside of Morocco, and invests in various sectors including agriculture, the agro-food industry, urban transport, fuels, livestock, fishing and real estate activities. At the head of this bourgeoisie are traditional families which have increased their economic power thanks to the support of the Moroccan regime in exchange for their political loyalty. A working class has also formed, mostly of Moroccans working in fisheries, freezing of fish, phosphate, cafes and small shops, bakeries, and in construction. There are also public sector officers, some who carry out work effectively while others are being paid without working. This leads to a situation where an important part of the population is dependent on payment by the Moroccan state which creates a material relationship of interest that does not generate a progressive enmity. The protests in the region are marginal and mobilize categories of young people who do not have a great weight in relation to the population. The Moroccan regime realized that a large part of the Saharawi opposition has the objective of obtaining of concessions and material gains; the case of the camp at “Ggdim Izik” is a great example of this approach. Opposition to expatriates created a tension between the minority of the Saharawi population of the region and most of the expatriate workers, which turns any mobilization into a minority rage and facilitates its containment. Morocco has also contained the protests that began in the region in 2004 to improve social conditions, which evolved to demand human rights and self-determination. The regime was able to absorb the particularities of these mobilizations and their methods of work, identify their leaders and points of strength, infiltrate and erode them - now they seem exhausted and their slogans are those an aggressive political conflict, and more than that, reactionary tribal character. A speech by the King of Morocco, Mohammed VI, on November 6, 2014 was expressive of the degree to which the regime has benefited, repeating the vocabulary of the era of his predecessor Hassan II, who reigned from 1961 to1999: negotiations will not affect the sovereignty of Morocco over its Sahara, the maximum we can give is “autonomy” - the case has no relationship to decolonization - the Sahara is a case of existence and not of borders - Morocco was left with its Sahara and the Sahara will remain Moroccan until the end of the world. This revived discourse represents the end of a tactic followed by the Moroccan state since fits initiative to make autonomy the basis for negotiation. Now the regime has dealt a hard blow to any hope that the autonomy initiative was the beginning of another approach for the system, based on the international situation and appropriate regional and local incentives. The only window the regime has left open is negotiations based on its conditions: “Morocco has no complex about negotiating directly or through the mediation of the United Nations with anyone, but we insist that Moroccan sovereignty over all its land is non-negotiable”. Polisario has lost all its instruments of pressure; guerrilla warfare to grab acquisitions is now a thing of the past. Militarily the Moroccan regime has renewed and strengthened its military arsenal and built three defensive walls. But what has weakened Polisario more is its reliance since 1991 on negotiations and campaigns of international public opinion centred on human rights and the exploitation of resources. The campaigns have gone past their peak. The Moroccan regime imposes a policy of fait accompli, which increases the anger of the refugees in the camps against the leaders of the Front. 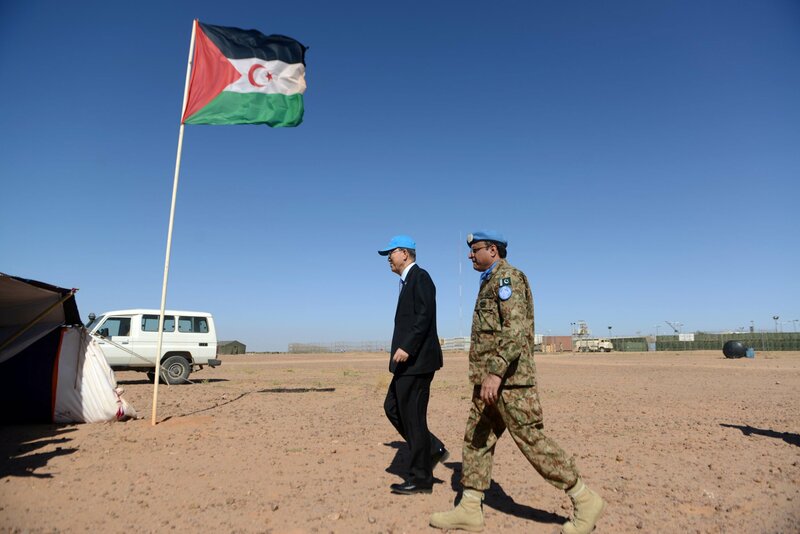 To get rid of the pressure the Polisario promotes the illusion of a solution through the United Nations and bets on the blackmail exerted by some Western forces against Morocco with regard to the Sahara. This promotion of illusions can only increase the complaints and discredit Polisario. After the US representative at the UN presented a draft resolution to the Security Council, which requested the broadening of the tasks of the UN’s Mission in the Western Sahara, “Minurso”, to include the monitoring of the human rights situation in the region, the Polisario Front prematurely declared victory, claiming the recommendation was sure to be passed because it came from the USA. They were shocked when the proposal was withdrawn. The report of the UN Secretary General last year, including ideas of creating a new independent and credible instrument to monitor the human rights situation in the area, confirmed that the stalemate could not last and suggested that 2015 would be a year of decision for the case. The Moroccan regime responded with unusual force, suspending any form of cooperation with the UN envoy Christopher Ross and with the president of the MINURSO mission, demanding clarification of the internationalist mission and its tasks. Because for Morocco its role is simply to control the cease fire and submit reports that are not going to bother anyone. That crisis lasted 8 months and when the date of the April meeting approached, Ban Ki-moon made a phone call to the king, and Morocco declared the resumption of its cooperation with the UN functionaries after receiving guarantees from the Secretary General. The policy of the regime with respect to Western Sahara was hypocritical and two faced: an external discourse using the language of the UN and the agreements that have been signed, and a different discourse addressed to the people (mercenaries, the affirmative referendum, detainees and so on) The first time the two discourses came together was during the crisis when cooperation was suspended. The last report of the UN secretary general and the Security Council decision of April 2015 represented a submission to the Moroccan regime, a qualitative victory for its diplomacy, and a collapse of the illusions of the Polisario leadership. The Moroccan regime has in its hands means of pressure created by the unstable regional situation (the situation in the north of Africa and the Middle East), which make the Moroccan monarchy a factor of stability in a part of the world that extends from the north of Africa, the Middle East and the area of the Sahel and the Sahara. The Moroccan regime reminds the imperialists of its usefulness in the struggle with terrorism and in stopping the migrants who are waiting to enter Europe through Morocco. Polisario cannot exist without the help of the Algerian regime; the cause of Western Sahara will not exist without the financial, diplomatic and military support of Algeria. The fall of the Berlin Wall deprived the Front of the political and military support of several states, and the fall of the Qaddafi regime worsened its situation. The Algerian regime is in a deep and many-faceted crisis; the fall in oil prices (which represent almost 97% of the country’s monetary resources) worsens the economic, social and political situation in the country, Bouteflika’s ill health has generated an internal conflict in the regime, there is a rise of popular struggles because of austerity. The situation on the borders of Algeria is very unstable; Mali and the Sahelian zone are a huge area where armed groups coexist and where there is an international mafia market, Libya and its open supplies of weapons with the dangers presented, what remains of the Algerian terrorist groups who await an opportunity to return. These are the challenges facing the Algerian regime and explain its withdrawal, which Morocco attempts to take advantage of, infiltrating the African zone economically and diplomatically and competing with Algeria in its role as the resolver of crisis (in Libya - Central Africa-Mali and so on). Algeria is incapable of imposing its options on the UN or the Moroccan regime. All they can hope is that things stay as they are and do not worsen, but what is certain is that we are on the verge of new developments in the whole case. The shock is profound, discontent is generated, and the leadership is uncomfortable and nervous as a result of the last resolution of the Security Council. They waited too long. The masses, leaders and activists need at least a tiny victory to reduce the pressure of defeat, but the blow has been very hard, and the credibility of the leaders is questioned. The leaders need an event to get out of this jam, and therefore will affect a firm attitude to the UN to deflect the anger of the population. The Moroccan regime welcomed its victory with politically drugged masses with speeches on the defence of national unity against enemies. Neither imperialism nor the authoritarian regimes nor the UN have any reason to resolve the case of Western Sahara, because they want to impose the submission of regimes. As the revolutionary left we have to tell the truth even if it is bitter and realize the manipulation made against the oppressed and differentiate between their interests and between the interests of those who govern or of the bureaucrats who benefit. We must defend the democratic solution to the case of Western Sahara in the context of the Democratic Union of the Maghreb, which will be only realized through a tidal wave of struggles and a programme of democratic emancipation, supporting each mobilization and each popular movement in the cities of the Western Sahara for democratic freedoms that would improve the situation of the workers. Hassan Abenay is an activist in the almounadil-a current in Morocco. This article was initially published in Arabic on November 5, 2015 on Al Mounadil. The footnotes are by IVP. The United Nations Mission for the Referendum in Western Sahara (MINURSO) is an integrated group of civilian, military and civilian police personnel established by Security Council resolution 690 of April 29, 1991 in accordance with settlement proposals accepted on 30 August 1988 by Morocco and the Frente Popular para la Liberación de Saguia el-Hamra y de Río de Oro (Frente POLISARIO). It was created to oversee the preparation of a referendum in which the people of Western Sahara would choose between independence and integration with Morocco. The settlement plan, as approved by the Security Council, provided for a transitional period for the preparation of a referendum in which the people of Western Sahara would choose between independence and integration with Morocco. The Special Representative of the Secretary-General was to have sole and exclusive responsibility over matters relating to the referendum and was to be assisted in his tasks by an integrated group of civilian, military and civilian police personnel, to be known as the United Nations Mission for the Referendum in Western Sahara. The Gdeim Izik protest camp was established in Western Sahara o October 9, 2010 and was dismantled by the Moroccan government in November of that year. This chapter allows the Council to “determine the existence of any threat to the peace, breach of the peace, or act of aggression” and to take military and nonmilitary action to “restore international peace and security”.